Favored by Classical Feng Shui Masters, the Three Chilins are known as the best remedy and most authentic method for countering 3-Killings affliction. It is known to be the easiest way to arrest this "Three Robbers' energy" in any living space. Featured in a victorious gesture, the flying Chilin with wings embodies magic, representing divinity, power and good fortune. Large in size, thick and heaviest among our selections, these colorful brass pieces sparkle in crystal colors and vibrant gold, exerting quality metal energy where classical masters claim to be a necessity for fighting the 3-Killings. Beautiful and dainty, it serves as a neat, tidy and classy looking hanging for modern homes. The remedy will protect you from legal problems, violences, lawsuits, gossips, scandals, backstabbings, obstacles, prevent accidents/losses, enhance good fortune and bring in good luck. Apart from protecting you, it is also able to axe away your opponents, enemies, competitors or evil counterparts. For example in 2019, the 3-Killings come from the west direction, therefore display them in the west. If you have a west door, hang them at the door. This item is energy infused and emits energy unendingly. Item comes with certificate of authenticity. 1. It is the cure against the 3-Killings energy so that one can be saved from legal issues, violence, robbery and fatality. Those who are afflicted are those who have their bedroom, maindoor and home facing the direction of the 3-Killings or in the sector of the 3-Killings. 2. The horse, rooster, rabbit and rat directions are the four cardinal directions that take turns to be afflicted by 3-Killings from year to year. Therefore, these zodiacs in specific are more prone to legal issues, violence, robbery, fatality and unstable career. In 2019, the west is "sitting" on the 3-Killings. Those who are born under the zodiac Rooster will potentially have to face legal battles. The nearby signs of Monkey and Dog will also be experiencing the same impact. 3. The direct opposite direction of "sitting" is the "facing" direction. Although facing the 3-Killings may not result in severe misfortune, but they should be overcome as well to totally eliminate the negative impact. In 2019, the east is the facing direction. Therefore, the Rabbit sign will need to overcome the wrath of the 3-Killings as well. 4. Those who are prone to legal issues or who are currently in a legal battle can display them beside the bed for assistance. Normally those who are in business, those who do not wish to open a can of worms, those whose job requires them to avoid the police force, those who did not properly declare their income to the tax department etc will have to display the chilins to prevent legal problems. Those who are facing lawsuits can also display it to win in the court battle. What the Chi Lin symbolizes? The Unicorn, Dragon Horse or the Chi Lin is a fabulous heavenly creature of good omen, and the symbol of grandeur, felicity, wise administration, longevity and illustrious offspring. It had attained the age of 1000 years old and said to be the noblest form of animal, emblem of perfect good incarnated essence of Five Elements. The predominant characteristics of the unicorn is its perfect goodwill, gentleness, and benevolence to all living creatures. It possessed all the good qualities found in all animals and has the head of a dragon, scales of the carp and body of a horse. Some believed that the Chi Lin was actually a giraffe. If one were to observe carefull, it could be the fact! Its voice is like the sound of bells and other musical instruments. It carefully avoids treading upon any living insect, or destroying the grass under its feet, and its gait is regulated according to propriety. It is reputed to be able to walk on water as well as on land and last appeared before the birth and death of Confucious. Confucious was often associated to the Chi Lin because he was born a sage after his mother stepped on the footsteps of the the Chi Lin and got pregnant. The Chi Lin is regarded by Buddhists to carry the civilizing Book of Law on its back. In ancient feng shui studies, the Chi Lin was described as coming out of Yellow River and appeared to Fu Hsi, the first legendary Emperor, bearing on its back a mystic Ho Tu map from which the Flying Stars formulas is said to have evolved. It is always seen as solitary, and appears to mankind only when a king of the highest benevolence sits upon the throne, or when a sage is about to be born. It had appeared during the halcyon days of the Emperors Yao and Shun and when Confucius was living, but so degenerated have mankind since become that it has never since shown itself to us again. Since the Chi Lin is a wonderful combination of a dragon's head and a horse's body, it produces a harmonized mixture of excellent qualities between the two auspicious animals. It has a more royal status compared to the other guardians and is simply adorable. The Chi Lin blows "sheng chi" because of its Dragon head to benefit surrounding. Unlike lions and other fierce creatures, the Chi Lin representing a "new born baby" by ancient chinese is very loyal to its owner and easier to tame, like a lovely horse. 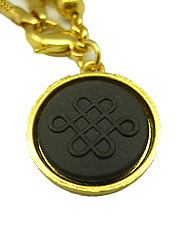 Its energy represent vitality, strength, ambition, good competing spirits, great health, perseverance and fame. Besides, it also has the scales of a carp which ushers in wealth, prosperity and abundance. The patterns on its back were used to derive the earlier heaven bagua, an ultimate symbol in the study of Feng Shui. The 3-Killings is referring to the invisible forces of 3 Robbers in the mountain. San He School masters consider this affliction to be the worst among the three shar, the 5-Yellow, Tai Sui and 3-Killings. 3-Killings bring robbery, lawsuits, quarrels, enemies, potential injuries and death. The best method to counter 3-Killings is to use three protective guardians according to San He system of Feng Shui. But San Yuan thinks that the metal element is also an important factor. Therefore to be on the safest side, we recommend you to use three protective guardians made from metal to counter this affliction as the best cure. Please ensure they are tangible looking and must not be hidden from view or else the 3-Killings will not be scared away. 1. One can display them by the bed of the person who is to be protected. 2. One can display them in the living room or center of the house facing the maindoor. 3. One can display them at the sector of the afflicted energies that causes legal problems and troublemakers. For example, in 2019 the west will be affected with such energies.